RRB Allahabad Recruitment 2018: Railway Recruitment Board is the organizations that work for the Indian Government. These recruitment boards manage and provide employment to the eligible candidates to work in the Indian Railways. There are 21 Railway Recruitment Boards spread across different parts of India. In this article, we are going to provide you with the information about the RRB Allahabad. RRB Allahabad JE Recruitment 2019 – Junior Engineer is one among the most demanded post in Indian Railways. With the increasing number of demand for the employees. RRB Allahabad is going to announce the RRB Allahabad JE Recruitment 2019. Go through the official notification completely and understand the procedure before applying. It is mandatory that the candidate appearing in the examination are eligible for the post. If the candidate does not fulfill the eligibility criteria will not be able to apply for the post. 02/01/2019 Latest Update: RRB Allahabad JE Application Form is released. Click on the link and Fill your Application form before 31/01/2019. Official Notification for the Allahabad Junior Engineer Recruitment will be announced on the official website of RRB Allahabad. The candidates can check the official notification, once it is released. The Application Form link will soon be activated and the candidates will be updated about it. RRB Allahabad JE Application Form 2019 can only be filled by the eligible candidates. Make sure you fill in all the correct details and submit exam fee in due time to avoid getting rejected. 26/12/2018 Latest Update(RRB Allahabad JE Recruitment): RRB has released the official notification for RRB Junior Engineer 14,033 posts. The candidates can read the notice in PDF below. 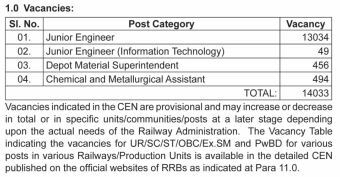 The Junior Engineer Recruitment from RRB Allahabad has been released for 14,033 posts. The candidates are advised to check the dates for the RRB Allahabad JE Application Form 2019. The Applications will be carried out in the month of January 2019. All the candidates are required to check if they clear the eligibility criteria before filling the application form. Following dates are announced. Railway Recruitment Board of Allahabad will soon announce the RRB Allahabad JE Vacancy 2019 for the candidates. In the official notice for the recruitment drive, candidates can check the RRB JE Vacancy, RRB CDMS Vacancy, and RRB CMA Vacancy. it is advisable to wait for the official notification for the release of the confirmed RRB Junior Engineer Vacancy 2019. Railway Recruitment Board has released the confirmed dates that RRB Allahabad Jr. Engineer Online Forms. The candidates should read the official notification and confirm their eligibility criteria. Following steps can be taken to fill the application forms. Fill in the details that are required in the RRB Allahabad JE Application Form 2019. The RRB Allahabad was earlier housed in a large rented accommodation on Sardar Patel Marg, which is a well-known landmark of Civil Lines, Allahabad. RRB Allahabad carries out the recruitment process of Group “C” staff. Recently it is also assigned with the recruitment responsibility of Group “D” staff. RRB Allahabad is also assigned with the responsibility of the recruitment of the North Central Railway, including both for the NCR Headquarters office at Allahabad as well as the divisions of Allahabad. RRB Allahabad Group D Admit Card has been released online on the official website of the RRB Allahabad on 13th September 2018. The Railway Group D CBT Admit Card can be downloaded by entering User ID and Date of Birth. RRB Allahabad releases the RRB Admit Card 4 days before the date of the examination. Candidates are notified regarding the Railway Allahabad Group D Admit Card 2018 on their registered mobile number and e-mail id that they have submitted during the Registration. The RRB Group D Hall Ticket will be available online only on the official website of Indian Railways – www.indianrailways.gov.in. The RRB Allahabad Admit Card is a very important document that must be carried to the Examination Centre. It serves as an Identity Proof for all the candidates. No candidate will be allowed to enter the Examination Hall without an RRB Allahabad Loco Pilot Admit Card 2018. Update – RRB will activate an Objection Tracker for ALP Candidates tomorrow (14th September 2018). Click here to Login. RRB has released Help Desk Link for the Group D candidates. Click here to raise a query. RRB has activated Mock Test Link for RRB Group D Appicants. Click here to take the Mock Test. Forgotten your RRB Group D Registration Number? Click here to retrieve your Retrieve your Registration Number. RRB Allahabad has already released RRB ALP Admit Card 2018 for First Stage CBT. 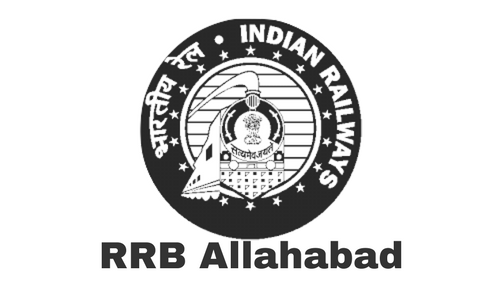 The RRB Allahabad Admit Card will be released 4 days before the date of the examination. The Railway Loco Pilot Admit Card of RRB Allahabad will be released online only. The RRB Allahabad ALP First Stage CBT has been started from 9th August 2018 to 31st August 2018. The RRB Allahabad will release the RRB Loco Pilot Admit Card 4 days before the date of the examination. Candidates can be able to download the RRB Assistant Loco Pilot Admit Card by entering their Registration Number and Date of Birth. The Railway Loco Pilot Admit Card is a mandatory document that has to be carried by the candidate. The RRB Allahabad ALP First Stage CBT Hall Ticket will carry all the important details about the candidate and examination. The RRB Allahabad Recruitment has recently released a job vacancy for the post of Assistant Loco Pilot and Technicians. The eligible candidates must fill the forms before the last date. The candidates have to fill the application form in a precise manner and submit it along with the mentioned documents and certificates before the last date of application. The candidates who are interested in applying for the Railway Jobs are requested to acquire their Aadhaar cards. They have to mention their 12-digit Aadhaar number while filling up the application. This rule has been introduced according to the Provision of Aadhaar Act and Regulation Section 57. RRB Allahabad has released notification for the Assistant Loco Pilot (ALP) Posts o. The date for applying for the posts will start from 3rd Feb 2018 and the last date to apply is 5th March 2018. The candidates must complete their High School and Intermediate class from an authorized institute. The applicants must have achieved ITI Degree from a recognized Institute/University. The minimum age for applying must be 18 years and the maximum age should be 30 years. The upper age relaxation is applicable to the selected candidates as per the Government norms. The Railway Recruitment Board conducts an online written test followed by a skills test for the applicants. The dates will be declared for the written test after the last date of the application form. When you reach the homepage of the website, a link is displayed on the screen. This link is found in the notification section of the homepage. Click on the link “CEN 01/2018” for RRB Allahabad ALP Recruitment 2018. After clicking on this link, you will be redirected to a new page, which is the application form page. The applicants have to give the necessary and correct information in all the mentioned mandatory boxes. Now upload the recent passport size photo and the signature. Once you are done with all the above procedure, recheck once if all the data you have prepared is correct or not. Then click on the submit option and proceed to pay the application fee. The application fee can be paid either through internet banking, debit or credit card or through SBI Bank Challan. After the payment of the fees, the candidate can finally download and print the application form for further purposes. RRB Allahabad will soon release the Admit cards for RRB ALP and Technician Posts on its official website. Candidates will receive a notification on their registered mobile number and e-mail id about the release of admit card. It is expected that the RRB Admit cards for ALP will release in the month of May/June 2018 due to a large number of application form submission. The admit card of the RRB Allahabad ALP 2018 is issued to those applicants who have successfully submitted the online application form and made the payment. If the RRB Allahabad department has accepted your application form then you are eligible to download the admit card. The admit card for the RRB (ALP) can be downloaded from the official website of RRB Allahabad. The admit cards are available online 2 weeks before the exam date. First of all, visit the official website of RRB Allahabad. After reaching the website, in the homepage click on the CEN 01/2018. As you click on the link you will be redirected to the online application process system where you can check the status of your application. If the status of your application is OK, then click on the generate admit card section and fill the online application details. The result of RRB Allahabad can be checked from the official website. All the applicants who are interested to apply for this post must carefully see their eligibility for the exam. The candidates who are disqualified from appearing the RRB Exam will automatically fall under the ineligible category. The board has prescribed different schedules for the different candidates thus they are required to apply for the post accordingly. The candidates who have applied for the post need to download the call letter from the official website of the board as RRB Allahabad is not sending the admit cards personally. RRB Allahabad has released Official notification for Railway Group D Recruitment 2018. Railway Board indicates 62907 vacancies for various Grade IV posts in Level-I of 7th CPC pay matrix. RRB Allahabad invites Online Application Form eligible candidates for the Posts – Track Manager (Trackman), Helpers, Gateman and Pointsman under RRB Allahabad CEN 02/2018. The details of the recruitment notification and the online application will be uploaded to all the 21 RRB Official websites. The Online Application for Railway Group D Recruitment 2018 starts from 10th Feb 2018 and the last date of filling the online application form is 12th March 2018. So, if you are preparing to get into the Railway Jobs, then you are at the right place. Relaxation in the upper age limit will be applicable for the Reserved Category students. The details regarding the Relaxation criteria will be notified of the detailed version of RRB Allahabad CEN 02/2018. The candidates can apply for this posts online on the Official Website. A separate website will be launched for the application of this Recruitment. The application link will be updated in the respected RRB Allahabad official website. Each website of the zones and divisions will have separate apply online links. The RRB Allahabad Group-D Online Application 2018 Link will be available as per the schedule. The reserved category candidates must note that their application fee of Rs 250/- will be refunded after deducting the bank charges after they have appeared for Computer Based Test.